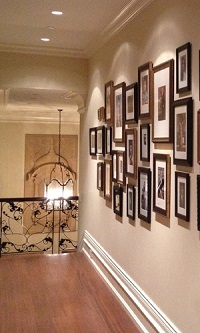 As an interior designer, wall-space can be as integral to a room as floor space. Custom framing, whether for photos, artwork or mirrors, can utilize that space in a way that contributes greatly to the overall vision of the room. Framagraphic works closely and collaboratively with the interior designer, from frame selection to installation assistance. Framagraphic has the services to help you meet the needs of your client. Please contact us for more information regarding Interior Designer Benefits at Framagraphic. Some of the extremely talented designers Framagraphic has had the pleasure of working with include Stephanie Brown Design Inc., Amy Kassam Design and Lonetree Kitchens and Baths. Stephanie Brown Inc. is a Vancouver-based Interior Design firm specializing in custom residential design. As Principal Interior Designer of Stephanie Brown Inc., Stephanie Brown is one of Canada’s emerging young designers. Her work has been featured in publications such as Canadian House & Home, Western Living, and Avenue Magazine. Amy’s passion is creating “beautiful”. She left her mark in the Fashion Industry as a successful stylist and accessories designer before pursuing her love for Interior Design. Amy’s ability to blend the old and new, the high and low, the ordinary with ornamental, has attracted a loyal following who have come to depend on her imagination and inventive use of resources to create spaces that are both chic and livable. With 4 exceptional designers on our team, Lonetree can meet all your design, renovation, and construction needs. As Interior Designers serving the Vancouver area, we love to help our clients achieve the amazing spaces they can be proud of for years. We are charter members of the National Kitchen and Bath Association.